Three lessons we can all learn from the original summer blockbuster. For our podcast on Jaws, click here. "I used to hate the water." My mother tells a great story about my grandfather. One night, he takes his kids out for a ride on the family boat. They amble along the South Jersey shoreline for a while before he cuts the engine and stares into the void. The kids look up, confused. What did he see? He points. They crowd. My uncle crawls to the edge of the bow to see what's what. Then my mom. Then my aunt. Three children shove and push, all claiming to see what the fuss is about but none being sure. The old man bellows with laughter as his kids catch their breath. My mother still claims the sound of the horn sent them at least three feet in the air, and none of them ever forgave their father for the heartless prank. What made them such easy marks? They had just seen what would later become household legend, the film we still get together to watch today. They had just seen Jaws. On June 20th of this year, Jaws turns forty. It's one of the most important films ever made. It shocked audiences, packing theaters for an entire summer. It invented Steven Spielberg, then a 27 year-old nobody. Most of all, it revitalized an industry tiptoeing along the edge of its own obsolescence. The safe bet had always been to spread the resources among several projects and hope one had legs. The success of Jaws inspired studios to tailor their release schedules around a single, massively bankable film. And thus was born the summer blockbuster. Jaws succeeded against impossible odds. It shouldn't exist. Peter Benchley's book should never have become a bestseller. Universal should have pulled the plug long before the infamous 159-day shoot came to an end. The harsh waters around Martha's Vineyard should have swallowed it whole. Jaws came to us through luck, happenstance, and sheer force of personality. Personality is the operative word here. In its infancy, the summer blockbuster had to sell its audience on spectacle and originality. It had to feel different than anything we'd seen before. Today, originality is the enemy. Marvel scrapped Edgar Wright's Ant-Man when it strayed too far from their Shared Universe. Films released after 9/11 are already being remade. Rarely is an audience asked to buy into a novel premise or meet unfamiliar characters. This isn't to bemoan our current cinematic atmosphere, but to illustrate the change in expectations. They simply do not make them like Jaws anymore. Jaws' production was plagued with problems, forcing Spielberg to get creative. The animatronic shark didn't work. Every usable foot of shark film made the final cut. It's why the crew of the Orca spends forty-five minutes chasing three yellow barrels. It's why John Williams' relentless two-note score is so powerful. It's why Spielberg strapped the camera to the shark's head in a moment of inspired subjective cinematography. The shark itself is almost unnecessary because our imaginations do the heavy lifting. Necessity is the mother of invention. It's also the mother of brilliant cinema. Michael Bay's computer will never face a comparable challenge or create as memorable an image. Jaws is the perfect mix of high and lowbrow art. Crowds came for the shark, but cineastes stayed for the chief. Brody's fear of the water in the face of his tremendous responsibility compels limitless empathy. His stand against the shark is far more philosophical than elemental. Consider Amity's dependence on "summer dollars" and the mayor's obligation to the status quo. Consider Quint's hunt for revenge and Hooper's naive attempts to prove his mettle. 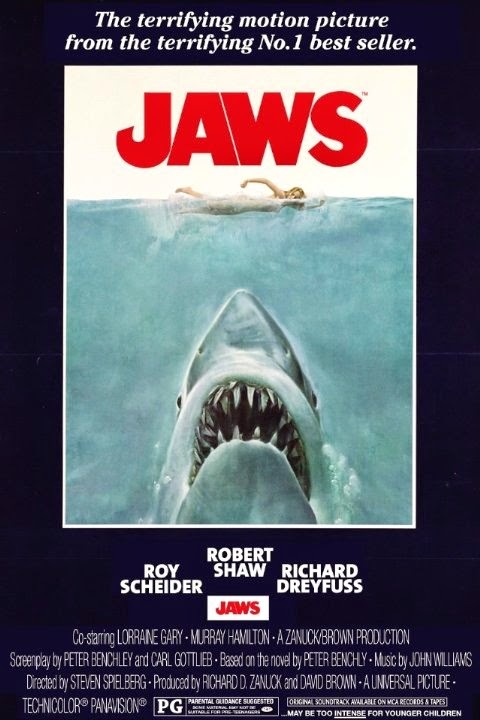 Jaws is much more than a monster movie, presenting its antagonist as a metaphor for everything from the Soviet Union to the perils of parenthood. It also swallows people whole. Jaws' marketing embraced simplicity. Illustrator Roger Kastel's iconic poster conveys the premise of Jaws in a clean and concise way. The trailers pair menacing underwater photography with Percy Rodriguez's deep baritone narration. Universal understood that Jaws' appeal was primordial, even instinctual. There was no need for the hard sell. The shark will attack you in your moment of greatest vulnerability and there is nothing you can do to stop it. Try conveying Age of Ultron's themes in such effortless terms. Today's directors cite Jaws as inspiration, but rarely do they follow its example. Perhaps we've all learned the wrong lessons. Four months of shooting on the Atlantic can be grueling, but thirty days on a climate-controlled sound stage brought us Attack of the Clones. A two-ton model shark made of clay and plaster is hard to manipulate, but it sure beats the cartoonish nonsense of Green Lantern. Innovation and simplicity do not have to be mutually exclusive. Modern blockbusters can still achieve incredible results with the most traditional methods. Dynamic characters can be just as charismatic as heroic archetypes. "Slow ahead," as the man said. Rob writes and podcasts for The Ugly Club. Jaws is available on Blu-Ray from Amazon.com.